The perfect complement for any wall hung TV providing the perfect spot to tuck away all TV components. Discretely hide all of your miscellaneous system hardware behind the tinted grey glass doors - the small footprint is a perfect space saver. The Rich Ravenwood Black finish and unique C shaped chrome feet add personality to any home decor. Bring home this contemporary furniture by Sonax, proudly built in North America. The Liberty 53.14 Mid-Century Modern TV Stand is the perfect blend of quality craftsmanship, brilliant design, and purposeful functionality. Featuring a large open compartment, one hidden cubby, and three center shelves to create the ultimate entertainment center perfect for stashing DVDs, board games, electronics, and media accessories. Free standing and easy to maneuver, this piece will mix well with any decor and its artful grooves will create a statement in any space. Holland 20-inch W Component Stand in Ravenwood Black with Glass Doors The perfect complement for any wall hung TV providing the perfect spot to tuck away all TV components. Discretely hide all of your miscellaneous system hardware behind the tinted grey glass doors - the small footprint is a perfect space saver. The Rich Ravenwood Black finish and unique C shaped chrome feet add personality to any home decor. Bring home this contemporary furniture by Sonax, proudly built in North America. 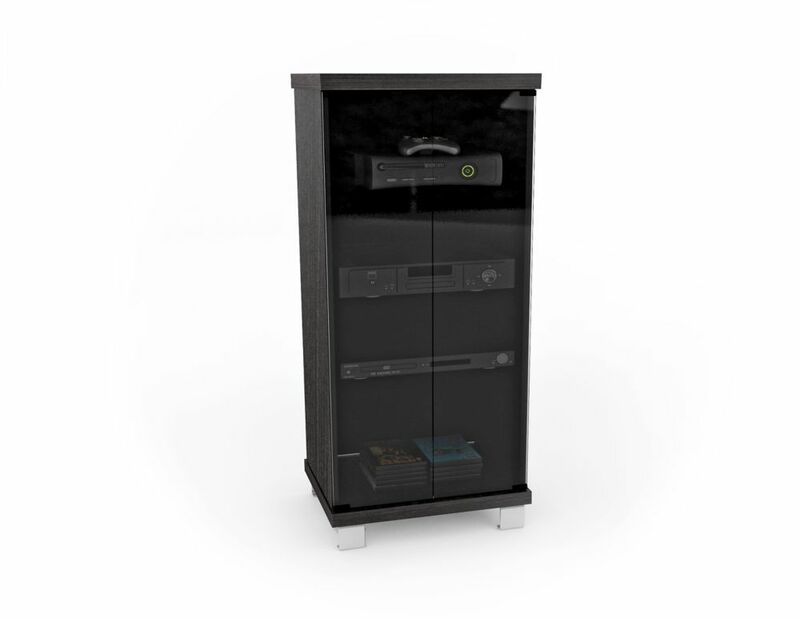 Holland 20-inch W Component Stand in Ravenwood Black with Glass Doors is rated 2.5 out of 5 by 2. Rated 2 out of 5 by will63 from Looks nice but has flaws After reviving some old analog audio equipment, I decided I would purchase a cabinet for them. This unit certainly looks nice from the photos, has two full length glass doors and it's fairly tall as well. But I found some annoying quirks with it. 1) Be warned that the depth may not sufficient for larger A/V equipment such as Yamaha home theatre receivers (mines an older RX-V800). As a result, the back end of the unit protrudes about an inch from the rear of the cabinet. The structure of the cabinet is dependent on three cardboard rear covers/stiffeners that are nailed into place. One of the covers had to be cut in order to accommodate the receiver and the connections behind. 2) Glass doors are flimsy, thin, and tend to rattle when closing. Furthermore, the cabinet is designed so the edges of the doors on the hinge sides are not recessed by the sides of the cabinet, but are exposed. You must be careful to not hold the door when moving the cabinet, otherwise you will likely shatter the glass. 3) Cabinet has 4 legs that are attached with screws to the base of the cabinet. The legs have rubber feet on the bottom which I assume are to protect the floor. In my case the cabinet is heavy due to the equipment inside, and it's very difficult to move the cabinet due to the friction generated by the rubber feet. Castors would have been much preferable to the legs for ease of movement. I am actually contemplating replacing them. The finish on the inside of the legs is poor, and is visible from the outside. 4) Three shelves are provided with the unit and sit on small shelf supports pins that are attached to the sides. The shelves do not have slots to lock onto the pins, so as a result the shelves will slide when equipment is pulled which is very annoying. Also it is important that the cardboard stiffeners are securely attached behind the shelves. If not done properly, the sides of the cabinet will shift outwards, and the shelf will fall off the pins! Overall this unit does the job and is easy to put together, but it feels flimsy, and I am nervous when moving it around. It would work much better with castors, although I must admit that my cabinet is fairly heavily loaded. The cardboard stiffener used at the back is cheap, but is critical to the structural integrity of the unit. For the price, I would have expected something better. &nbsp;Is there a shelf near the top where a cover lifts up to access a turntable? &nbsp;If this unit does NOT have this option, is there one available that does?